When the experience of a legendary course designer and wild Creswick Forest came together, it’s easy to see why a golf course unlike any other was born. 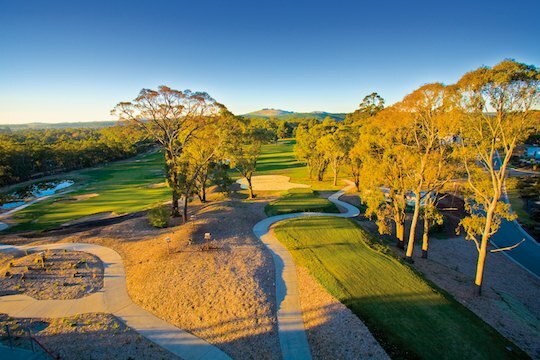 Internationally-renowned golf course architect Tony Cashmore has transformed the existing 90-year-old Creswick golf course into a vision of open greens winding between handsome strands of messmate and yellow box gums with an air of international appeal. An integral part of the experience is also the Novotel’s Forest Resort Creswick. As part of this commitment, the resort has even built a privately-owned water treatment plant. It is the first of its type in the country and makes the property Australia’s premiere drought-proof resort. Furthermore, the golf course management team has implemented an environmentally conscious maintenance regime involving the use of state-of-the-art natural and organic products. This has been carefully designed to significantly reduce the need for toxic chemicals and pesticides. Set amongst 150 acres, the Forest Resort golf course will make for an extraordinary bushland golf experience featuring broad slopes, cooling creek systems and fairways set in cathedral-like passages, all invoking a lush ‘Augusta’ type of experience. Cashmore’s inventive par-72 course design parallels that of Augusta National, home of the US Masters Tournament, but with an authentic Australian flavour. Like Augusta, specific indigenous plant species gives each hole an individual feel. The international-class course can stretch to a championship-testing 6300 metres from the back tees, with each nine having two par-fives and two par-threes. The course design has allowed for the natural flow of land to determine the course routing wherever possible using all available ground elements – ridges, swales, spurs and trees to create golf course holes with individuality, visual beauty and strategic flexibility. The golf course surrounds also accommodate a practice fairway and other training areas and is flexible enough to suit all player levels, from a novice standard to challenging the professionals strategic skill sets. A number of historical relics reflecting the past Goldfields era and earlier Aboriginal history will be preserved throughout the golf course with interpretative story boards. Historic water races and gold diggings have been protected and will be preserved for future generations to appreciate. The Forest Resort Golf Course was unofficially opened in November, 2007 to give selected golfers and visitors the opportunity to see the exciting new course. The almost 100-year-old Creswick Golf Course was closed in 2005 to make way for the construction of the new course and very little of it remains in the new design. The fundamental principles of the old course can, however, be seen in many of the design concepts of the new golf course. Natural tree corridors of mature messmate eucalypt were retained to encourage the native flora and fauna and to provide micro environments well protected for long term sustainability in mind. Greens were constructed with a predominant focus on USGA sand profile/perched water table principles with the playing surface exhibiting a considerable amount of movement on a relatively small surface area green. The serious challenge however for the average golfer is perhaps to fully read and understand the unforgiving movement of the greens and indeed to find them in regulation as they can often be a well-protected and can be considered quite a small target. The State Government entered into an agreement with Novotel Forest Resort Creswick’s developer to begin delicate and lengthy negotiations with the Traditional Land Owners -the Dja Dja Wurrung people. The extensive process paid off and a landmark Indigenous Land Use Agreement (ILUA) was signed after five and a half years. It was the first such agreement to be reached between traditional Land Owners and a resort/ golf course developer. The successful agreement is now considered one of the most significant Indigenous agreements in Australia. Green fees start at $25 for 9 holes and $40 for 18 holes. Carts are available for $40 and range balls start at $5.50 for 30.